Meet Tyler Mengel, of Mengel Miniatures. you probably although know of him and if you do you have probably seen his amazing battletome and army of the Endless Deserts. Although this isn't just a model or even models I am showcasing, I believe the whole project needs to be showcased as one due to the nature of it. I managed to speak with Tyler and ask a few questions. Below is the chat we had as well as a few (and I mean only a few) pictures of the army and world he has created. 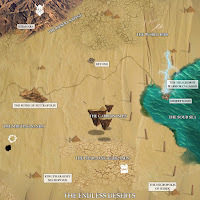 Sean: Hi, Thanks for taking time to answer some questions and tell us about your miniatures and hobby, What made you want to create the Endless Deserts 'world' for a better word? Tyler: It all started out as just a Time of War rule set actually. 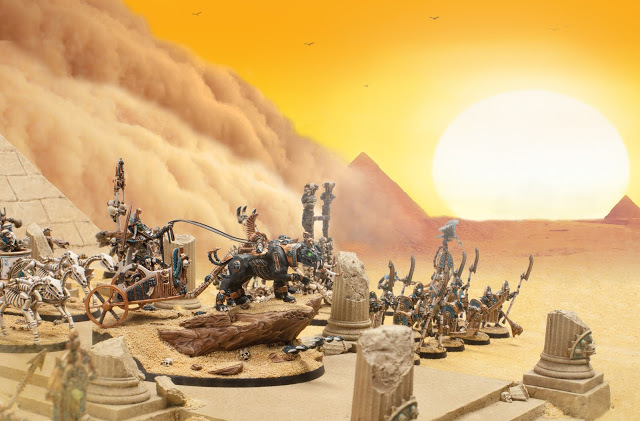 I wanted to try my hand at creating some AoS rules and figured that the Time of War rules would be easiest and fittingly fluffy to use. 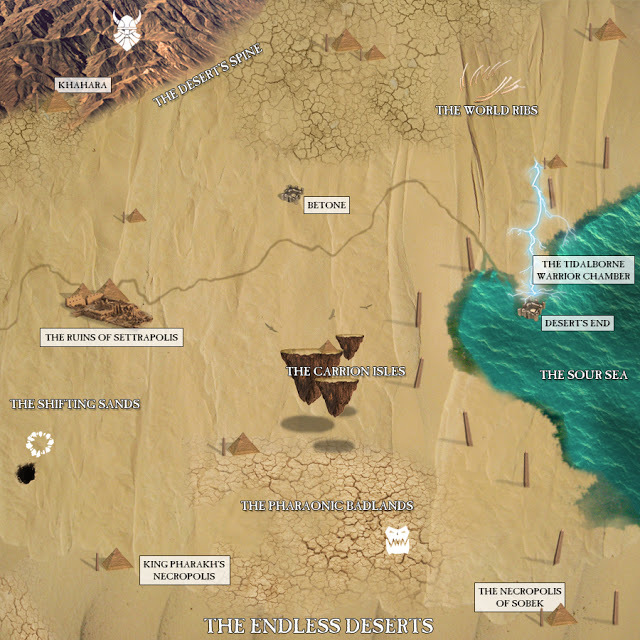 I just wanted some cool desert rules and had to come up with a name for the place so I picked the Endless Deserts. From there it kind of snowballed. I was also really interested in trying to make my rule sets look as professional as possible, so next up was a Battleplan, then the Vital Objectives rules. Once Adepticon came around I decided I wanted to make my army list something special, so I came up with the idea of making professional looking Warscrolls for my units using pictures of my own army. I wanted the booklet to not be super thin so I came up with some lore to take up space. 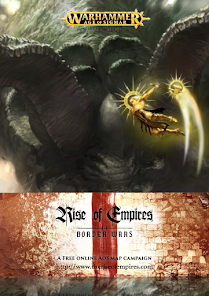 I was really happy with what I was able to come up with so I decided it needed a space to live permanently on the web, from there it just kept expanding to make it feel like a fully fledged and well rounded area that could exist within the Realms of AoS. Sean: The detail of the display board and backdrop to the army is amazing. If there is simply way to explain. Whats the best way to go about creating this? Tyler: Thank you! 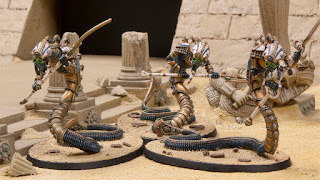 I made it as part my Armies on Parade entry a few years ago. I actually have a post explaining the process I used to make it along with some WIP pictures of it. The pyramid itself is made from pink foam with the bricks scribed in with a pen. The walkway thing is just several layers of foam board cut to size and the pillars are wedding cake toppers that I broke apart. They were hollow so I had to fill the inside of them with tin foil to take up space then sculpted the broken stone texture on top of that. The statue and the skull on the pyramid were from random gift shops. 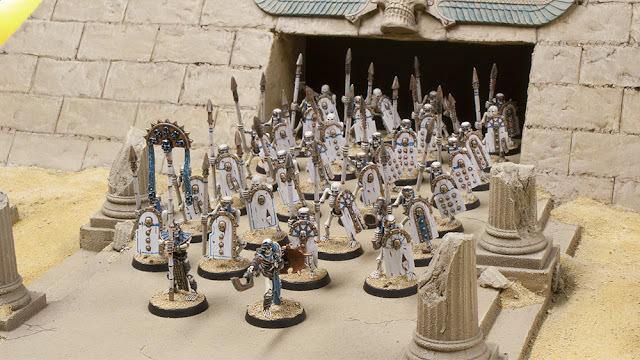 Whenever I see a gift shop that has odd stuff like that I take a look to see if there is anything in there I think I could use for my Tomb Kings. I had to dremmel off the statues face though and resculpt it as a skull. The rest of the bits came from my Tomb King bits box. It’s just a 2 for by 2 foot board, so anything else you see in the pictures I post is Photoshop magic. Tyler: Painting is definitely my main love. I only get a game in maybe once a month if I am lucky. I also really love the story. All of my armies have some sort of story created for them to give them context. 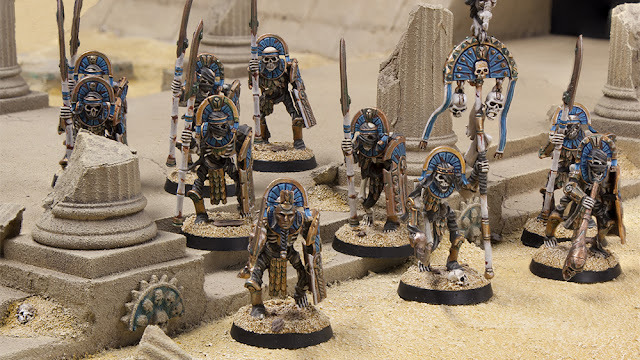 There’s King Pharakh for my Tomb Kings, Orros Firestorm for my Stormcast, and I was individually naming each of my Space Marines for my Astral Claws while I was working on them. I have always been attracted to a good story over everything else. When everyone was excited for the new Halo game for the multiplayer I was always the most interested in the story mode. Tyler: The scene is pretty good, it’s not super huge, at least at my store, but it’s strong, which is what matters. It helps that Brad, or as he’s known online, Rhellion, plays at the same store as me. HE is always organizing stuff and pushing the hobby. Tyler: I’ve been in the hobby since I was about 10 or 11, which was sometime around 2000? So about 16 1/2 years? I remember this because when I was a kid I had newspaper under my painting station which I never changed out and I recall looking at it about 4 years later and the date on it was sometime in June of 2000. I started with the 3rd edition starter set for 40k and promptly painted all of my models as Ultramarines. They were probably actually my single largest army ever until my 40k Nurgle army around 2009 and then my Tomb Kings. I am a bit of a hobby butterfly, so it was hard for me to stick with one project all of the way through, but I have definitely been getting better at it. I got the 6th edition starter box for Fantasy as well, which actually came out right after I joined the hobby. I had a small Demon army during the Storm of Chaos campaign, and also briefly started an Ogre army and a Middenheim army. I worked at a GW store for a year when I was in high school so I also got to use the store’s armies to play sometimes. I remember painting a lot of their Ogres as well as the Wood Elves when they came out in 6th edition. Tyler: Of course. :) I am super excited for it. I think I will be playing my Stormcast during it so I can fight for the side of Order. This will also get me to paint a bit more of them. 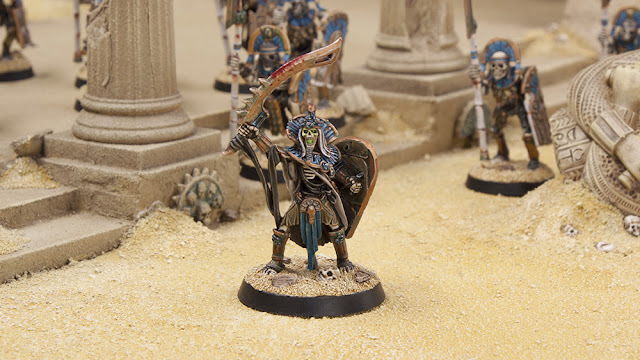 I love my Tomb Kings, but I have more then a full army painted for them at the moment, so I think it’s safe for me to branch out a bit. I’ll keep coming back and adding more to my Tomb Kings though, no worries there. 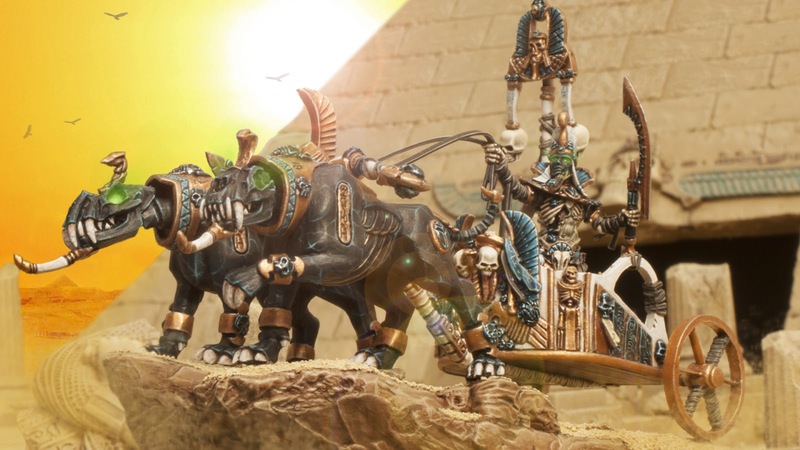 At the moments I have 2 Sphinxes, a Bone Giant, a Tomb Scorpion, horse archers, a few charaters, more Ushabti, 3 Necropolis Knights, and about 10 chariots to paint. So there is plenty that will keep being added in. 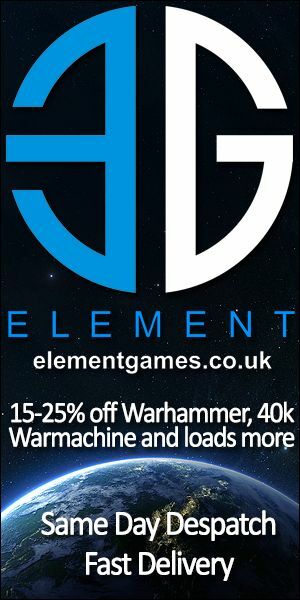 I am planning on going to a local tournament near me in the Fall, and then definitely Adepticon as well. I will probably take my Tomb Kings to both and I want to get some more stuff painted for that so I can run a new list. There’s nothing like a deadline to get you painting. Tyler: Thanks for having me and be sure to check out the Endless Deserts website as well as Mengel Miniatures. 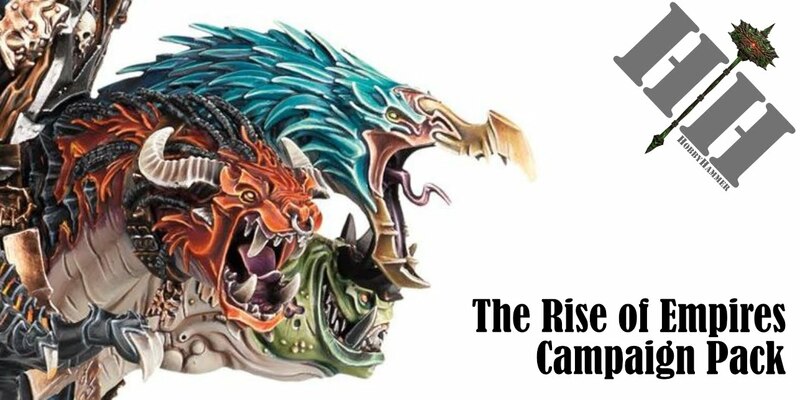 I will have a painting competition coming out soon as well to coincide with the Season of War campaign, so keep an eye out for that. There are going to be some awesome prizes that you won’t want to miss out on. Thank you so much for your time and keep up the great work!